Chinese New Year is coming soon. And soon enough, we will be hearing frantic shouts of “Lo Hei” and other auspicious phrases as people around a reunion dinner table take part in the traditional tossing of the Yu sheng. This long-standing tradition continues to this day as a way of bringing good luck and abundance in the coming year. As with other traditions, one may ask: how did it start, where did it come from? How has it changed throughout the years? Come and understand the significance of Yu sheng and see where you can find the best one to try in Singapore. How did it reach Singapore? What kind of Yu sheng can we find in Singapore? Yu sheng (鱼生) (yusang in Cantonese) literally means “raw fish” in Chinese, and it refers to a special dish that is served during Chinese New Year. This festive CNY dish is made of thin slices of raw fish, colorful vegetables such as radishes, carrots, special crackers, sesame oil and a sweet plum sauce. Part of the tradition when eating this dish is chanting auspicious phrases as it is tossed using chopsticks, by everyone around the table. According to Singapore’s Infopedia, this raw fish salad dates back to more than 2,000 years in mainland China. Scholars and historians have cited the serving of such as far back the Zhou and the Han dynasty. Even poets wrote about it. In later dynasties, when fresh fish was difficult to get, only the areas near the coast such as Guangzhou and Chaozhou still prepared it. From China, the Cantonese (from Guangzhou) and the Teochews (from Chaozhou) migrated to Singapore and brought with them the tradition of preparing yu sheng, which most Singapore-Chinese families practice to this day. 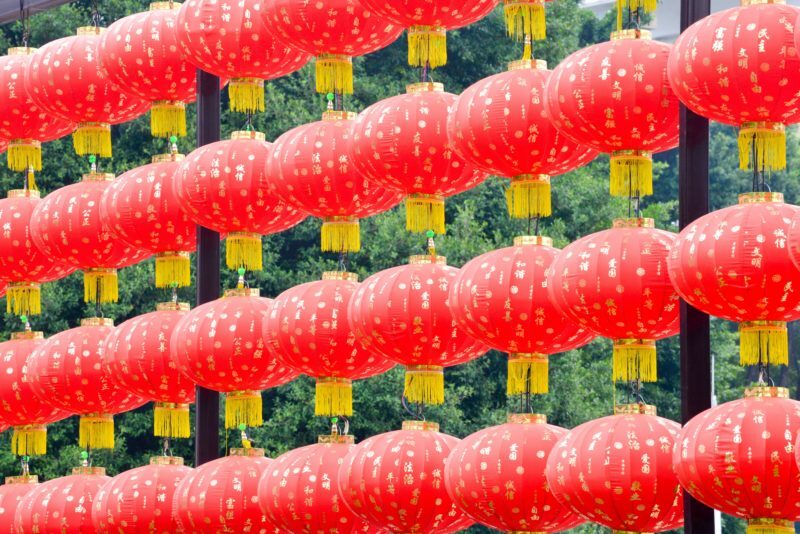 During the 19th century, it was customary to serve it on the seventh day of the Chinese New Year, a day that is also called renri or everybody’s birthday in Chinese. 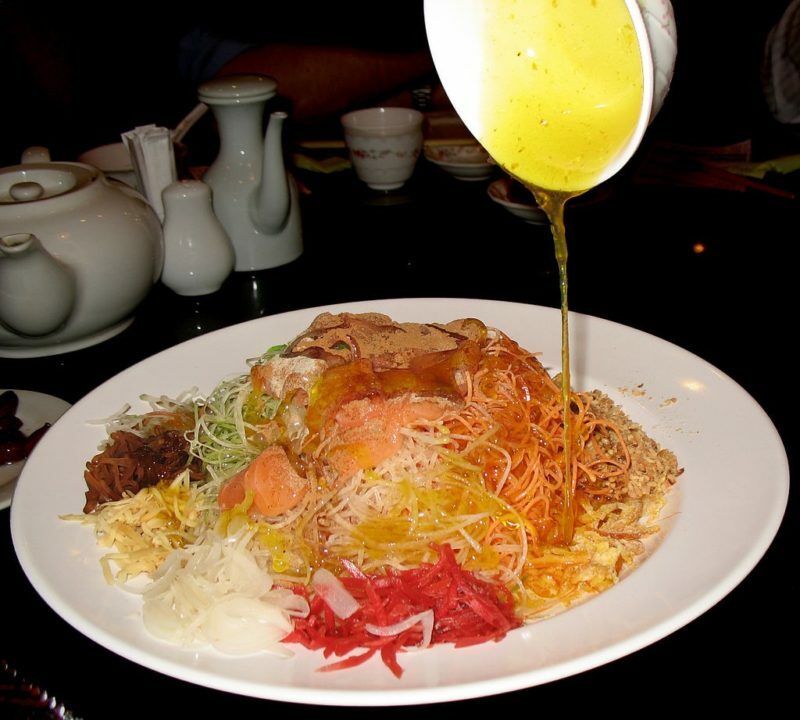 According to history records, Chinese from Jiangmen, Guangdong province sold the very first yu sheng in Singapore. The Singaporean-Chinese imbibed the tradition during Spring Festival celebrations as far back as the 1930s. Two types of the dish were served during that time – Cantonese and Teochew. 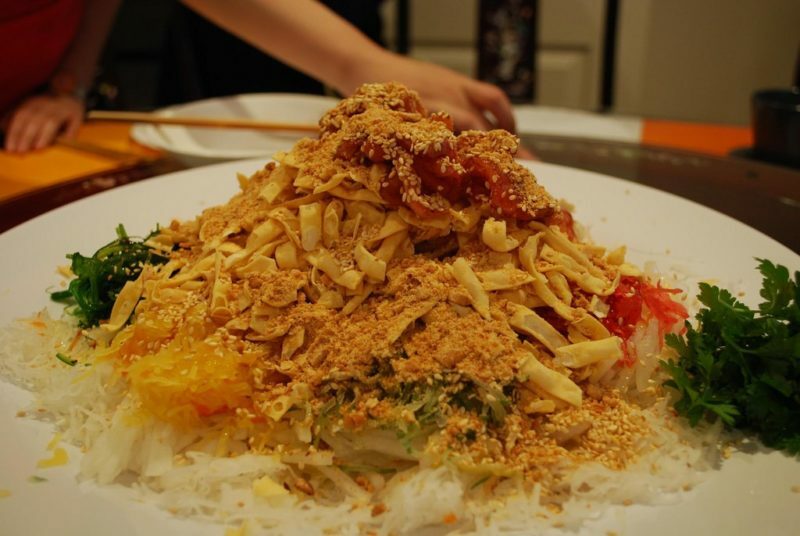 The Cantonese yu sheng was usually served on the seventh day of the New Year while the Teochew husay would be served all throughout the festivities. Businessmen usually preferred the Cantonese one. From the simple dish of raw fish which is usually air-dried and mixed with whatever vegetables are readily available, the yu sheng has gone through so many changes through the years. This day, the dish is typically enjoyed all throughout the New Year during a family’s reunion dinner. In the 1930s, when restaurants started offering yu sheng, some chefs started experimenting and innovating on its ingredients. From the start, there was no fixed recipe for the dish, thus opening it up to transformations through the years. New ingredients were constantly added such as pickled vegetables, and variations of the sauce were also introduced. The most popular type of yu sheng in Singapore nowadays is called qicai yusheng (七彩鱼生; “seven-coloured raw fish salad”), a colorful mix of raw fish and thinly sliced, colorful vegetables. This variation was said to have been introduced by culinary legends in the local restaurant scene called the “Four Heavenly Kings.” In the 1960s, these four chefs, Lau Yoke Pui, Tham Yui Kai, Sin Leong and Hooi Kok Wai decided to add color, variety and flavor by adding shredded white and green radish and carrots, ginger slices, onion slices, crushed peanuts, pomelo, pepper, essence of chicken, oil, salt, vinegar, sugar and more. They also started a new way of eating the dish by pre-mixing the sauce instead of having the diners mix it themselves. Although diners took some time to adjust to this new way, when it caught on, that was the start of the dish’s popularity in Singapore and even abroad. A stranger to the custom will probably find it amusing to see people standing around the table, with a pair of chopsticks in hand, tossing the salad as high they can. Add to this happy frenzy, all the shouts of “Lo Hei” and other greetings. When eating Yu sheng, take note the order of ingredients to be assembled and the phrases one should utter as this is being done. The fish goes first, which symbolizes abundance or excess. Next the pomelo, symbolising the luck that goes on top of the fish. Then the pepper is added for greater prosperity, after which the oil is drizzled in several circular motions to call for flow of money in all directions. Each of the vegetables signify different aspects of auspiciousness: carrots for good luck, green radish for eternal youth, white radish for prosperity in business and promotion at work. Lastly, peanuts are sprinkled over for youth, sesame seeds for growth in business and golden crackers for more prosperity. 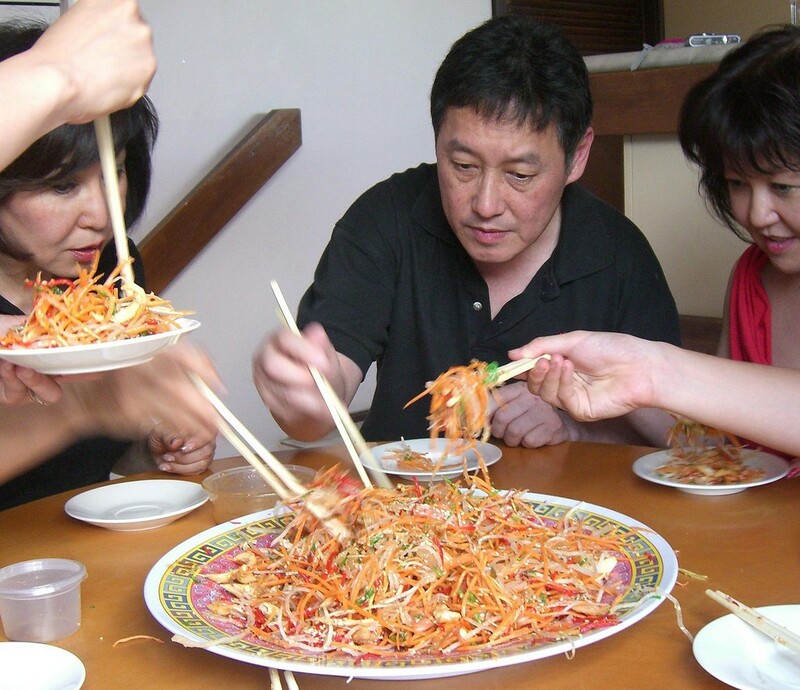 Once all of the ingredients are placed, everyone stands and shouts “lo hei” seven times. Then they begin the ritual tossing of the salad with continued shouts of auspicious greetings. Yu sheng is easily found in Chinese restaurants in Singapore during this festive season but not all yu sheng are the same. 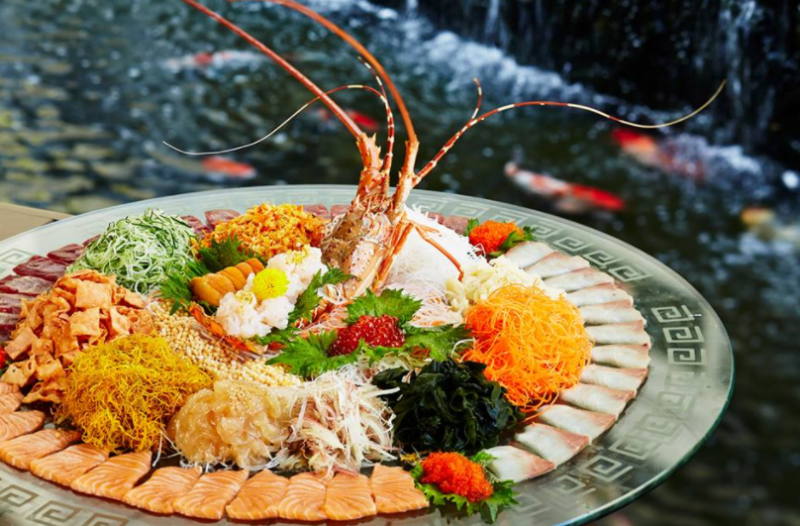 Here we present a list of the top restaurants serving the best Yu sheng in Singapore. Get ready to savor this once-a-year delicacy but remember to plan ahead if you wish to visit one of this establishments. It is best to make a reservation as this is a busy time for restaurants. The Dragon Phoenix restaurant prides itself as the place where the Original Yu-Sheng of the Four Heavenly Kings originated. According to the restaurant’s website, they still serve the same recipe of the dish that they introduced back in 1963. Their signature dish also has abalone for more flavor. With its two outlets in Singapore, you can choose to reserve your reunion dinner table for your family at this iconic restaurant. Online reservations are being accepted throught their website. 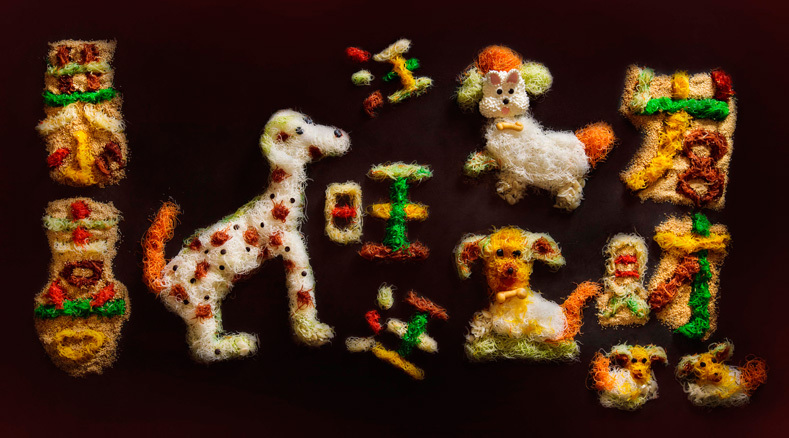 The dish continues to evolve to this day, as younger chefs and new restaurants think up of different ways to serve yusheng. The Golden Peony at the Conrad, for example, presents a 3D version of yu sheng. 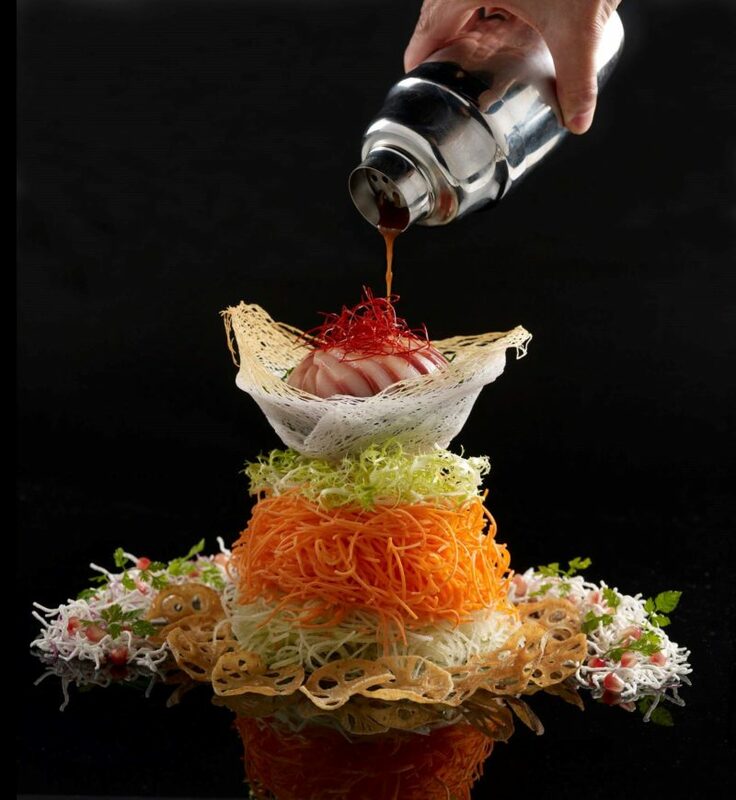 Their festival special is called Fortune 3-D Meringue Yu sheng with Abalone, Salmon and Crispy Fish Skin. You can bring along your whole family and more as their salad can feed 30 persons. For smaller groups, they also have dinner set menus that come with Fortune Salmon Yu Sheng, along with other Chinese delicacies. Reservations can be booked through the hotel’s website. 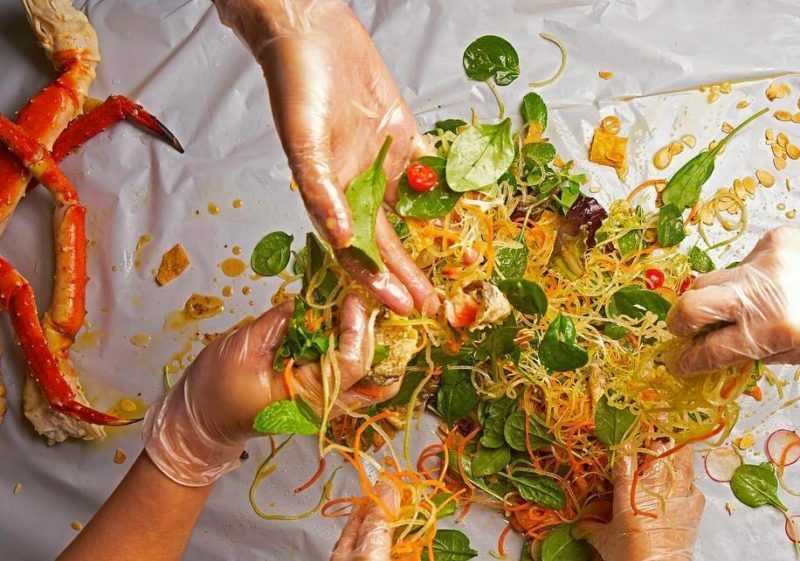 Fancy playing with your yu sheng and getting your hands dirty? Then seafood restaurant Dancing Crab has an interesting take on the traditional dish for you to try. Their version comes with Alaskan King Crab legs, smoked salmon slices, spinach, lettuce and carrots. Even their sauce is different – a homemade honey mustard sauce with a drizzling of olive oil. Diners are given hand gloves so they can toss their salad with their hands. 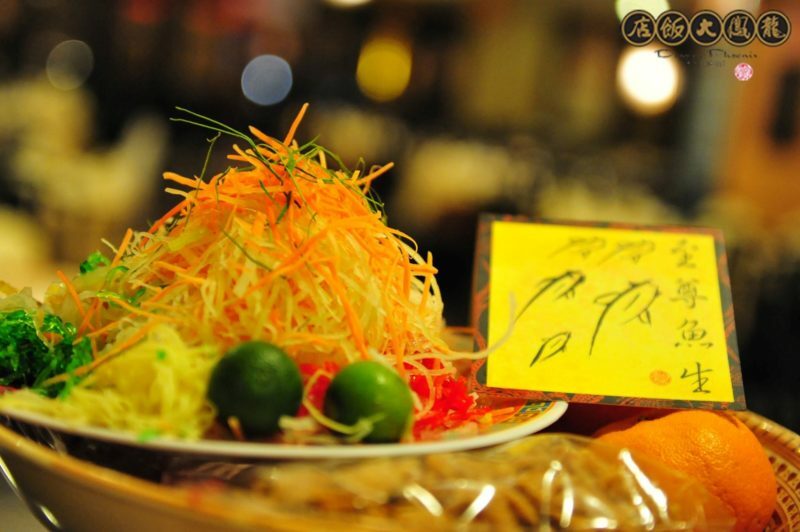 Among the innovations introduced to yusheng recently include a Japanese twist to the dish. At Keyaki Restaurant at the Pan Pacific Hotel, their Premium yu sheng is premium indeed, with lobster and delectable sea urchin or uni. It also has salmon and fish roe along with fresh vegetables. The sauce is based on the traditional ponzu sauce, which is a balanced mix of premium soy sauce and lemon juice. Mitzo is known for its modern yet artisanal takes on Cantonese cuisine. And its version of the yu sheng is testament to this. On offer this year is a King Fish Yu sheng, a beautiful mix of Kanpachi kingfish, crispy salmon skin, lychee caviar and mixed vegetables. What makes this dish unique is how the sauce is made: a tasty mix of soybeans, garlic, sesame seeds and spices in a cocktail shaker. This Chu Hou sauce is then drizzled over the salad before tossing. What are you waiting for? For an auspicious Lunar New Year, let’s shout “Lo Hei” and enjoy our yu sheng with family and friends. 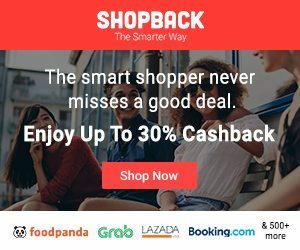 Do you know you can earn Cashback when you make your restaurant reservation through Shopback? Make your booking through Eatigo and earn while you eat.